Will Philadelphia Eagles quarterback Nick Foles finally get a handshake from New England Patriots counterpart Tom Brady? He is not concerned. 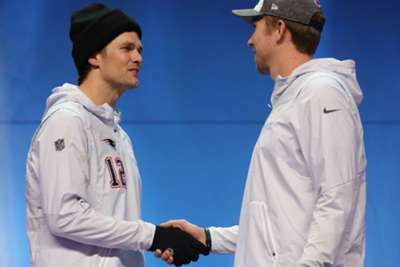 The quarterbacks did not meet for the customary post-game handshake following the Eagles' win over the Patriots in NFL Super Bowl LIII. Foles claimed he has not heard from Patriots great Brady since the championship game but the Eagles QB is not worried about whether or not the two engage at this week's preseason matchup. "We both have a lot going on in our lives so, you know, in time," Foles said, via ESPN. As far as Foles is concerned, there is no bad blood or unresolved issue that needs to be addressed. "It will happen when it happens. We practiced with the Patriots several years ago, and I got to stand there and talk to Tom for quite a bit. He's a great guy. I have all the respect in the world for him," Foles added. "I think everyone's making a really big deal out of this and it's not a big deal at all. I've already talked to him before, he's a guy I've always looked up to. You've got to admire someone who is probably the greatest ever and still going strong. "Even at his age he seems to get better and better. I've already had a conversation with him before when we practiced, so if we have one in the future, we'll have one and it will be cool." After recovering from a sore back, Brady "absolutely" plans to play in New England's second preseason game on Thursday.